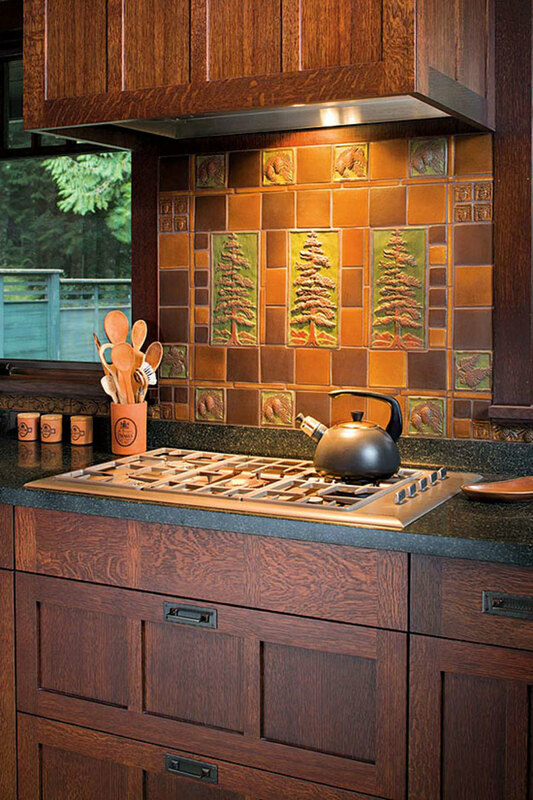 ABOVE:Motawi tile on the kitchen backsplash echoes Ponderosa pines nearby, in a new house in Arizona. Photo by Tim Fuller. There’s a new sophistication in the way tile is used in kitchens and bathrooms—particularly when the room is period inspired. We’re seeing not just neat backsplashes made of subway tile—in cream, green, even burgundy—but also art tile moving into these rooms. And plain tile is being used in unique ways. Ever practical, waterproof, and easy to maintain, tile also introduces dimension, color, and a period sensibility to kitchen or bath. Unglazed tile, often with a custom border or studded with deco tiles, is back in style for floors. Brick-shaped subway tiles are ubiquitous in kitchen backsplashes and bathroom wainscots or showerbaths. Hand-crafted, colorful art tile adds a Craftsman, Art Nouveau, or Art Deco note to the room. 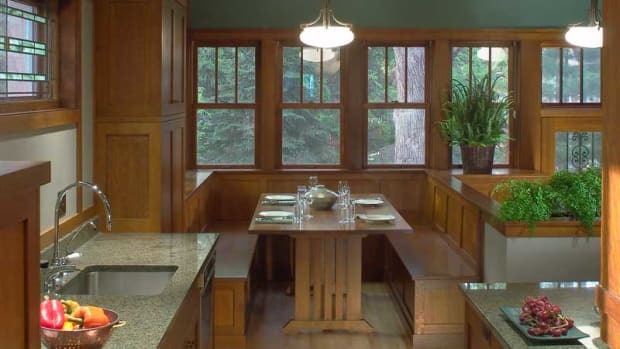 In an Arts & Crafts Revival kitchen, an artistic tile panel by Handcraft Tile Co. and oak cabinets lend appeal to a kitchen with modern appliances. Photo by William Wright. 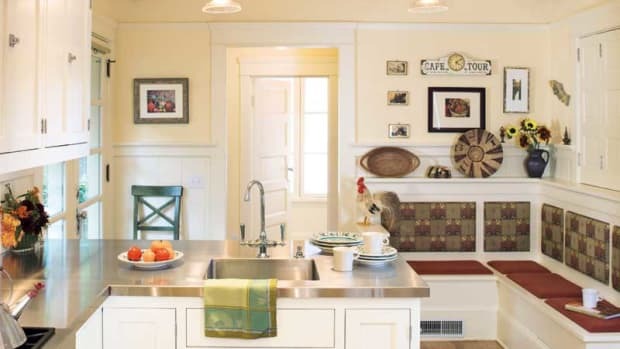 The true bungalow kitchen may have been a sanitary service room with little embellishment, but Arts & Crafts Revival kitchens are like other public rooms. Besides hardwood cabinets and artful lighting, they often include installations of tile that lend warm color and unique expression. 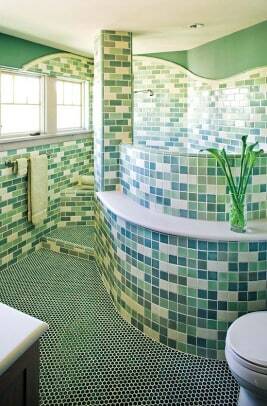 Tile is used in backsplashes, behind the stove, and in framed wall accents. Relief tiles add dimension. You can get tile in almost any Arts & Crafts motif: pinecones, oak leaves, frogs, and dragonflies are just a few. 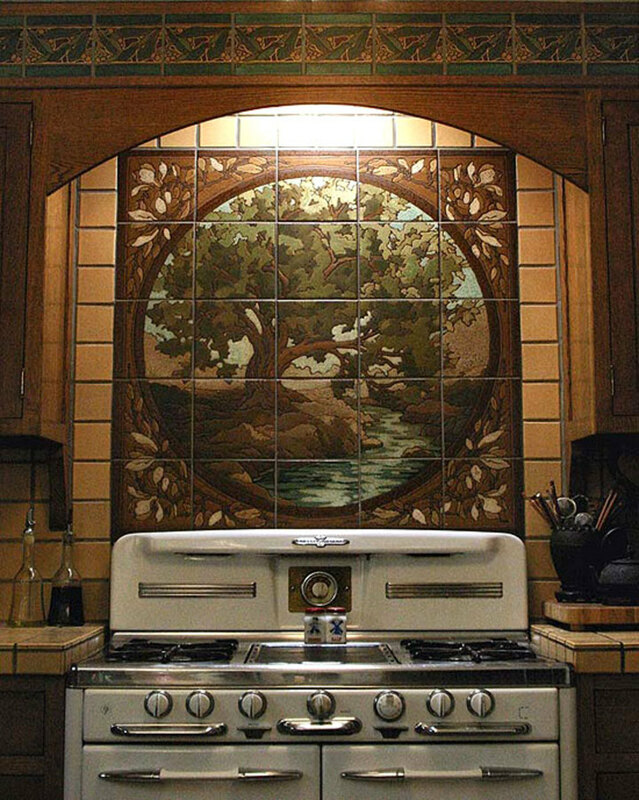 Individual art tiles make up a mural or tile “painting,” this time behind a vintage stove. Courtesy RTK Studios. 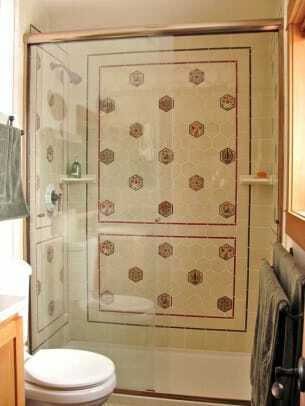 Tile murals are on-the-wall designs made up of multiple individual tiles. Always popular over the range or in a tiled stove enclosure, murals are showing up as wall art, the “picture” surrounded by border tiles or special framing tiles. 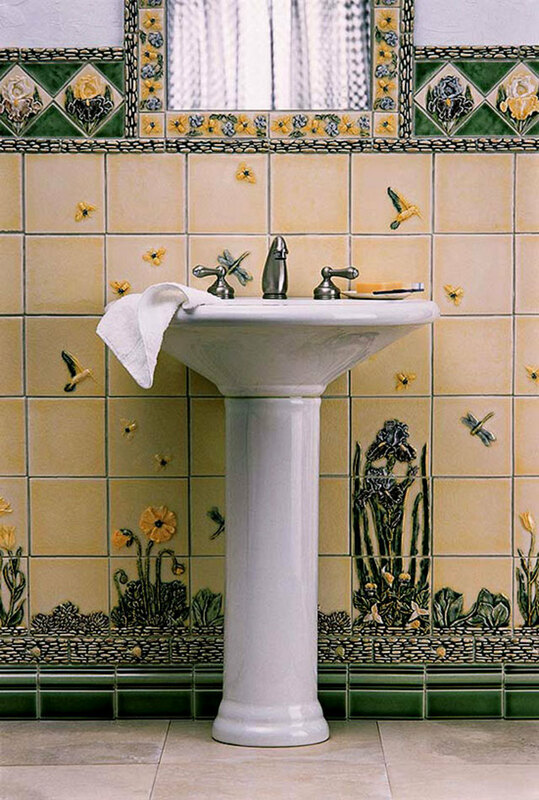 Nature comes inside in a tiled bathroom by Pratt & Larson; the arrangement is reminiscent of high-style tiled baths at the turn of the 20th century. In the bathroom, the colored 4x4 field tiles of mid-century have been superseded by tiles that recall pre-1920 bathrooms. Brick-shaped subway tiles, most often in creamy white, are appropriate for almost any period home. They may be accompanied by other shapes to form a dado, fill, and border on the wall, and by border and bullnose tiles, as well as pictorial frieze tiles. 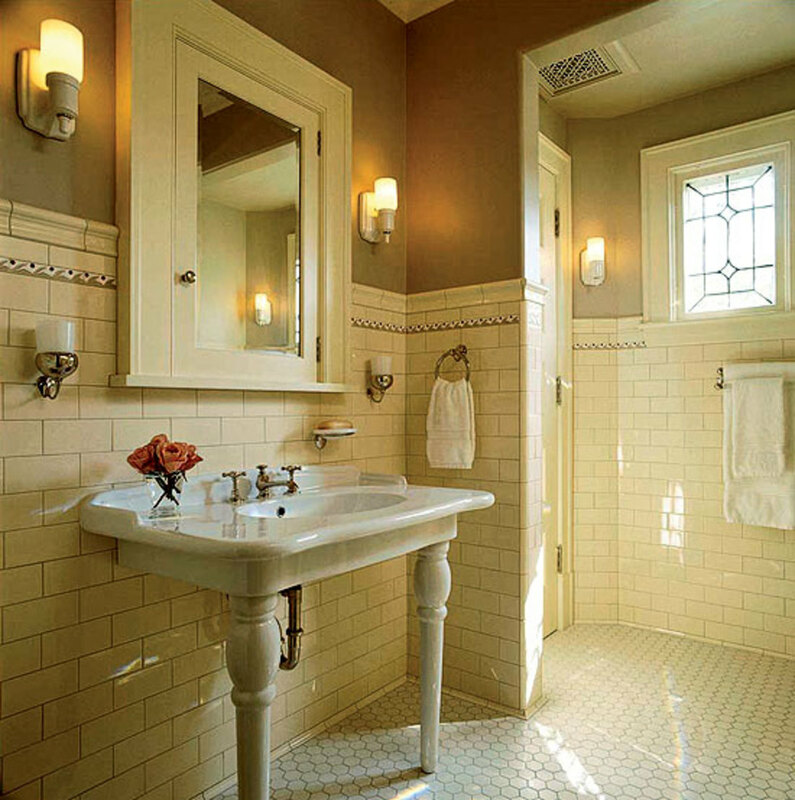 The white-tiled bath, here with hex floor tiles and a high wainscot of subway tiles, is a Belle Epoque classic enjoying a revival. The 1920s look works for houses 1890–1930s. Photo by Karen Melvin. 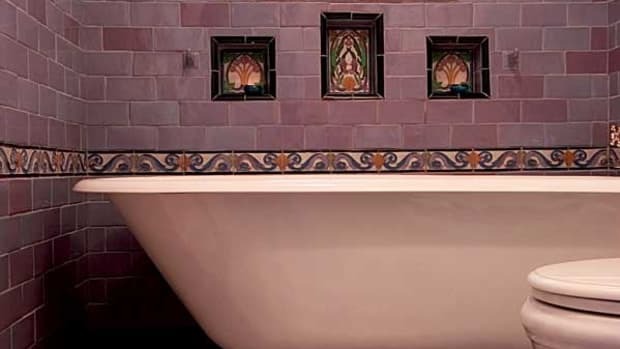 The Arts & Crafts Revival has introduced custom-designed installations as well as art tile into the bath. Richly colored tile wainscots join oak sink cabinets and trim to bring the Craftsman palette to well furnished baths. Wave forms and tiles depicting sea life are popular. Unglazed hexagon floor tiles recall a time before vinyl.